FIG. 2-1-A MASTHEAD RIG has the forestay attached to the top of the mast. This GLEN-L 25 has a backstay, upper shrouds, and two sets of lower shrouds supporting the mast. The boat uses a main and jib for working sails, plus an optional Genoa sail. FIG. 2-2-A typical JIBHEAD RIG such as this GLEN-L 11 has the forestay attached to the mast at some point below the masthead. The mainsail on this boat, as well as those in FIGS. 2-3 and 2-4, is connected to the boom only at the clew and tack, making them "loose footed"; that is, not attached along the length of the boom. Everyone knows what a sailboat is and most people have heard expressions such as "sloop" or "ketch." These words describe the configuration of the sails and masts on the boat, and we refer to this configuration as the RIG. Rigs have names which are defined by the number of masts the boat has; the number, shape, and locations of the sails; and sometimes by the position of the rigging on the boat. Most small sailboats under 25' have a single mast with one or two sails being used under normal sailing conditions. The SLOOP rig has one sail forward of the mast, and one sail aft of the mast. The stoop rig generally comes in one of two variations depending on where the FORESTAY (the wire which supports the mast from the forward side) joins to the mast. A MASTHEAD RIG, such as shown in Fig. 2-1, has the forestay connected to the mast at the very top of the mast (or MASTHEAD). A JIBHEAD RIG, as shown in Fig. 2-2, has the forestay connected to the mast at a point somewhat below the top of the mast. So, when we see a single masted sailboat with a sail fore and aft of the mast and with a forestay that goes to the top of the mast, we call it a "masthead rigged sloop"; and when the forestay is below the masthead, we call it a "jibhead rigged sloop". FIG. 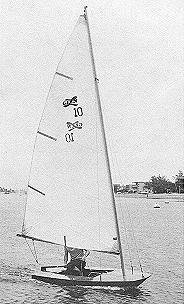 2-3 -The typical CAT RIG uses a single mast well forward with the sail located on the aft side of the mast as shown by this GLEN-L 10. The stays consist of two shrouds and a forestay. 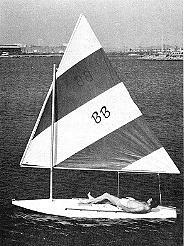 A boat with a single mast located well forward in the boat and only one sail, which is aft of the mast, is called a CAT RIG (Fig. 2-3). Do not confuse this term with "catamaran," which is a twin hulled boat, but which may also have a "cat rig." Depending on the design, the mast of a cat rigged boat may or may not be supported with wires (called "stays"; see Chapter 4). Figure 2-4 shows a cat rig with a mast not supported with wires, and is referred to as a "freestanding" or "unstayed" mast. 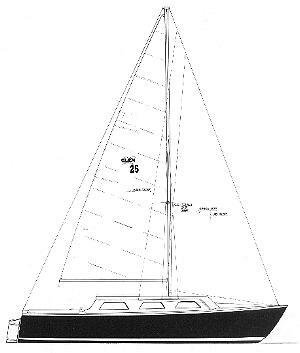 Another common rig used in small sailboats is the LATEEN RIG illustrated in Fig. 2-5. This rig uses a single mast, somewhat short, and usually unsupported with wires, onto which is attached two poles. A triangular shaped sail is then attached to these two poles, but not to the mast. The lower pole is sometimes not used, but the rig is still called a "lateen." The rigging of a lateen is usually very simple and uncomplicated. Sails can be considered the "engine" or power plant of the sailboat, while the rigging can be considered the "transmission," or the means by which the power is transferred to the boat to create motion. Therefore, to understand the rigging, it is necessary to know something about the sail configuration, because both work together as a unit. FIG. 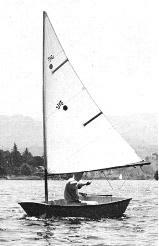 2-4 -The GLEN-L EIGHT BALL dinghy uses a sock-type sail which slips over the mast. Because the mast is free-standing, no stays interfere with the sail along the mast. This boat is also called a "cat rig". Just about all small sailboat sails are triangular in shape, and the terms used in describing one will generally apply to all. Modern sails are most often made of synthetic fabric, usually polyester (Dacron or equivalent). Some Nylon is used but it is considered inferior because it stretches too much in use, except for special sails such as spinnakers (see following). Sails in the past were made from cotton fabric, and may be to this day, but these require more maintenance and care. The sail of Dacron is virtually maintenance-free; just keep them clean and dry, and check occasionally for damage (see Chapter 11). Sails have names determined by their function and location on the boat. On boats which have only one sail, this sail is always called the MAINSAIL (the "main" sail on the boat). The lateen rig sail, while still a mainsail, is commonly called a "lateen" sail. Sloop rig sailboats have a mainsail also, and this is the sail located on the aft side of the mast. On sloop rigs, the sail forward of the mast is called the JIB, and the main and jib sail when used in combination for normal sailing are called the WORKING SAILS. The boat in Fig. 2-2 is under sail with main and jib working sails. Sails other than working sails are sometimes used, especially when racing or cruising. Two of the most popular types are the GENOA jib and the SPINNAKER. The Genoa (commonly called "jenny") is actually just an oversize jib used to increase the sail area, and hence the performance of the boat. The boat in Fig. 2-1 is designed to use a Genoa jib. 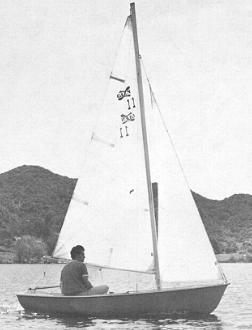 Sailboats under about 16' long seldom use a Genoa. The spinnaker is a parachute shaped sail (hence the nickname, "chute") used forward of the mast in place of the jib when sailing before or with the wind. Because the spinnaker is considered a "competition" item usually associated with larger boats, and requires specialized gear, it is beyond the scope of this book. The common triangular sail is best discussed by referring to parts OF the sail, and parts IN the sail, or the actual components used in the construction of the sail. Our discussion of sail anatomy is comprehensive, but note that not all sails will have all the items mentioned. Fig. 2-6 should be followed in the discussion of sail parts. Now for the parts OF a sail. The LUFF of the sail is the forward part, or the part which is considered to meet the wind first. The LEECH is the aftermost part, while the FOOT is the lower edge of the sail. The HEAD of the sail is the topmost corner; the TACK is the forwardmost corner, and the CLEW is the aft corner of the sail. The ROACH refers to the up and outward curve in the leech of the sail. The amount of roach will vary with the sail. The lateen-type sail has little or no roach, while mainsails used on catamaran sailboats have considerable roach. Next, we will describe the parts built IN a sail. To the beginner, the most obvious part built into the sail is the INSIGNIA and sometimes a group of numbers. The insignia usually tells graphically what the name of the boat class is, while the number refers to the registration number given to that particular boat in the class organization. Obviously, not all sailboats belong to a class, nor do they all have numbers on the sails. Most mainsails have BATTENS built into them. These are semi-rigid thin strips, either of wood or synthetic material such as fiberglass or plastic, used to maintain the shape of the sail when underway. The battens fit into BATTEN POCKETS sewn into the sail. Battens in order to stay in the pocket can be tied in. 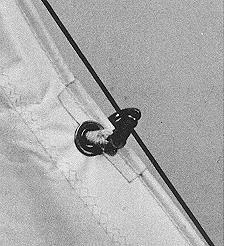 A better type uses what is called a "lock-sleeve" pocket which makes it impossible for the batten to slip out, but can readily be removed so the sail can be folded. Battens are usually located at almost right angles to the leech, but sometimes one or two battens are located along the foot at right angles on LOOSE FOOTED mainsails and some jibs. A loose footed sail is one that is attached only at the tack and clew points along the foot. The boats in Figs. 2-2, 2-3, 2-4, and 2-5 all have loose footed mainsails. The position and size of the battens is usually determined by the sailmaker or the designer of the boat. Some sails, especially on certain catamarans, use battens which span clear across the sail. FIG. 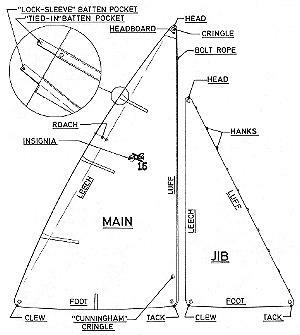 2-6 -The "anatomy" of a typical set of working sails. The two dimensional drawing does not truly show the actual three dimensional shape which the sailmaker sews into the sail. This "shape" allows the sail to form correctly to the wind, even though the sail appears to be a flat piece of cloth. Other parts built into the sail are primarily those used to attach the sail to the rigging. At the head, tack, and clew, most sails have CRINGLES built in for attaching the sails. These are merely grommets which reinforce the sail at the hole. Most mainsails have extra sail reinforcing at the head of the sail and this is called the HEADBOARD. The strains on the sail at this point are great, and the headboard with a cringle through it distributes the stresses. Several methods are used to attach the sails to the mast, boom, or rigging. The jib and Genoa are attached to the forestay in sloop rigs with HANKS or snaps (Figs. 2-7 and 2-8). These are special hooks or rings used to secure the sails to the forestay as well as allowing them to slide up and down. The hanks are usually sewn into the luff of the sail. Probably the simplest method of attaching the mainsail on lateen rigs, or in boats which have free standing masts, is by means of a "sock" sewn right into the sail which slips onto the spars. Two varieties of sock-type sails are shown by Figs. 2-4 and 2-5. The sock-type sail is limited to very small boats, but makes a neat and inexpensive sail. Also used on small sails are loops or line which fasten around the spars. FIG. 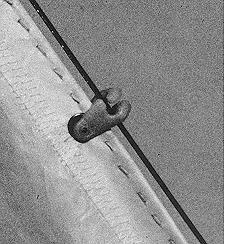 2-7 -Snap-type jib hanks sewn into the luff of the jib are used to attach the sail to the forestay. FIG. 2-8 -This type of jib hank takes just a twist of the wrist to secure it to the forestay. Larger jib sails usually do not use this type as they are not as strong as that shown in FIG. 2-7. On most boats, the mainsail is attached to the aft side of the mast in usually one of two ways. The first method is with TRACK SLIDES, pieces of hardware sewn to the luff of the sail at intervals of several inches, and which slide on a track fastened to the mast. A better and more common method is the use of a BOLT ROPE. This is a piece of rope the length of the luff and sewn right into it. The bolt rope fits into a groove built into the aft side of the mast. On sails which are not loose footed, this same bolt rope and groove can also be used for attaching the foot to the boom. Or, if track slides have been used on the luff, they too can be used on a track fixed to the boom. For details on spars (mast and boom), see the next chapter.